In this Topic, we are going to learn about Career in Node.js. As Node.js is a software development technology which is used to manage several issues with servers and web applications. It is one of the most used and widely popular technology. Node.js is open source and free and it is available for various platforms such as Windows, Linux, and Unix. Some of the specifics of node.js areas provided below for a better and in-depth understanding of this technology and its importance. Node.js is used to generate dynamic page content on the fly. Node.js is also used for creating, opening, reading, writing, deleting, and closing files on the server. Node.js can also be used for collecting form data. Node.js provides for addition, delete, modification of data in the database. Node.js can be used for eliminating the waiting, and it also simplifies the process by only continuing with the next request. Node.js can be used for running single-threaded and non-blocking programming which are of asynchronous programming. It is quite a memory efficient. Even those candidates who do not have a formal degree in computer science or a related field but have the working knowledge of this technology and can write a handful of code without many constraints are easily picked by companies for this job. Those candidates who are already working as a front-end developer or web developer can easily pick up this technology within a month of learning efforts and then successfully make a switch to work in this field. Many people also start their own startup or consulting business. Some go for blogging, online and classroom-based tutorials as well as teaching and book writing. App development, game development, and product development can also be exciting career options for such Node.js professionals. Software developer jobs are always in demand. Front-end development, UX/UI development, Server management as well as back-end development all of these sub-areas have the demand of well qualified and skilled workforce. Full Stack development is the new segment which remains the market leader in terms of offered job position as well as salary in software engineering and node.js is a skill which contributes a lot towards it. After spending a considerable amount of time and achieving enough control over the subject, people get huge benefits in terms of salary raise, promotion, and career growth. Entry level salary for front end develop is somewhere around 3-5 lakhs for graduates from tier B or C college whereas for tier A college it could be up to 7-8 lakhs. As one acquires more skills and get very knowledgeable with his/her domain the salary may increase up to 12-15 lakhs with 5 years of experience. Large MNC’s and reputed brands usually pay more for the right candidates with many additional benefits and perks. Similarly, full stack developers with 5-7 years of experience are often paid up to 20-22 lakhs by companies such as Google, Facebook or Twitter based on the project and complexity of the topic. If someone starts their own company or go for consulting business, then they can earn even in millions and billions. Front-end development with node.js and similar other technologies have nice career prospects. There is always a good demand for right candidates who have necessary skillsets and have executed mission-critical projects earlier. Usually, candidates are picked after the rigorous interview process and often the skill that employers look for is to have the ability of great conceptual understanding and ability to execute and implement technical features within defined time with utmost quality and functionality. Demand for full stack developer is usually more than the simple front-end or back-end developer. Such candidate handles a major chunk of the job and hence are paid more as well. Many developers with good business acumen also start their own companies which makes products or provide solutions to other companies or start their consulting business where they advise other companies and organizations on best practices of these new upcoming and advanced topics such as node.js. Apart from these, there is always a chance of research, patents, and publications. An innovation of similar technologies which are more efficient and robust is also a possibility. 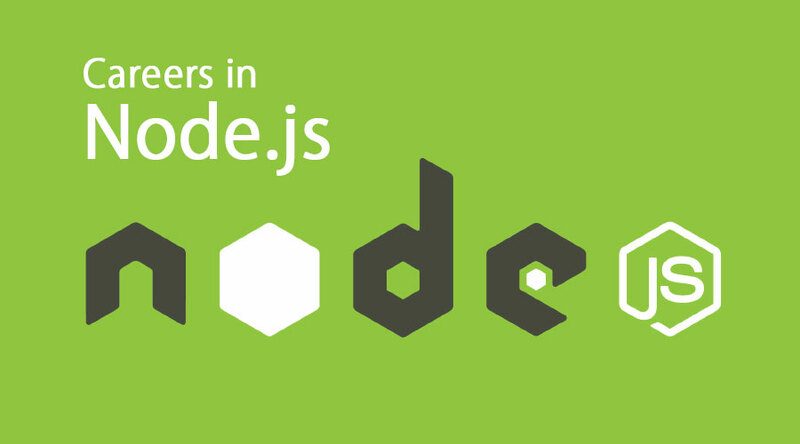 Thus, we covered a good deal of career aspects of node.js technology. Every technology has a certain time period in which it flourishes and then after that when new technologies come up, it slowly starts fading away and people start using those new technologies. Such a scenario is quite common in computer science where new technologies keep on coming every now and then. But this should not deter the prospective candidates as one who knows one technology ins and out can pick a similar technology if required very easily without any major problem. One should always be ready to learn and acquire new technology if one wants to work in the continuously changing field of computer science. Having said that, Career in Node.js is going to be here for quite a long time so candidates should not get afraid. One should obtain good foundational skillset with robust coding practice and then he/she shall be ready to rock the world of software programming.